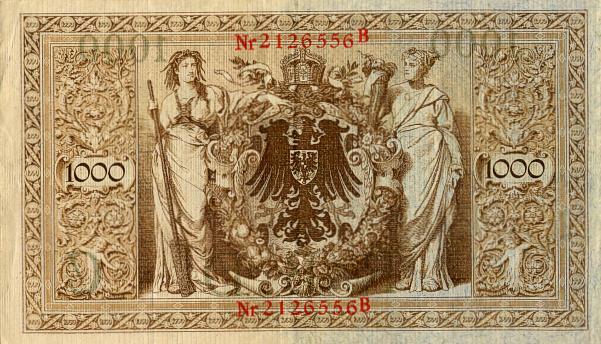 Beautifully engraved 1000 Mark Reichsbanknote from Imperial Germany issued in 1910. This item has the printed signatures of various German officials and is over 98 years old. The German Empire (German: Deutsches Reich colloquially Deutsches Kaiserreich) is the name conventionally given in English to the German state from the time of the proclamation of William I (German: Wilhelm I) of Prussia as German Emperor (January 18, 1871) to the abdication of William II (Wilhelm II) (November 9, 1918). The official name of the state in German was Deutsches Reich, but this continued in official use until 1943 and hence does not exclusively refer to the period of imperial rule.